While this feature actually shipped in November 2016 we wanted to mention it in this post as it was one of the highest customer requested features. This feature allows you to disable any step that might be causing issues with a deployment while configuring the project deployment process or you might just want to prevent the step from being run at deployment time temporarily. Previously you would either have to delete the step, assign it to a role that doesn't do anything or skip it at deployment time, not the cleanest or most user friendly solution! Now, we've added an option to the context menu of the step that allows you to disable the step so that deployments can still be performed while ironing out any kinks with the new step. This is a feature that is available in the BlueFin Chrome extension, but as not all organizations allow installation of browser extensions/plugins, or maybe you are not using Chrome, we decided to bring the feature into Octopus so that all our customers can take advantage of this functionality. 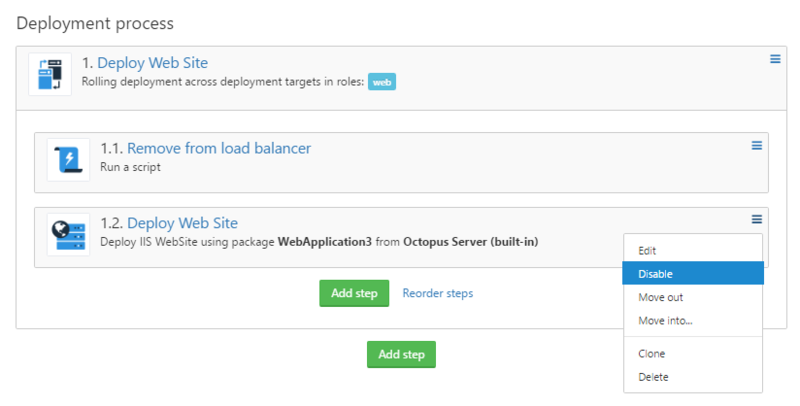 This feature allows you to tailor your deployment process at runtime by giving you the option to conditionally run or skip an action based on the boolean result of an Octopus Variable Expression. We're off to a good start to the year, and we have a long list of other great value add features ahead of us. We're really excited and looking forward to tackling these highly requested features. We really do appreciate all our customers input - so make sure you add your votes to your favourite feature requests!